JQ Talks: SK-II Malaysia's 1st Ever Pop-Up Pitera House + Instagram Contest! SK-II Malaysia's 1st Ever Pop-Up Pitera House + Instagram Contest! If you are wondering, yes, I'm still using SK-II, especially during those rebellious skin seasons. It's rather addictive, I can't let my miracle water go. In a new study, SK-II researches have discovered an intrinsic link between long-term usage of SK-II Facial Treatment and better skin quality as we age. Good news, people who started using the Treatment Essence in their 20s is proven to enjoy better skin in their 30s and 40s. Well, I'll say Amen to that! More impressively, 9 in 10 loyal users have better skin compared to non-users in the same age group and 7 in 10 users have better skin conditions as compared to non-users who are 10 years younger. You have no idea how thankful I feel right now, as if everything is starting to fall into place. In 10 years time, I'll still have better skin than those non-users who are 10 years younger than me. Pretty cool. Here's my SK-II thoughts after 3 months. Though, don't fret, it's never too late to change your skin destiny. Studies shown that women in their 50s and 60s who started using Facial Treatment Essence in their 40s still displayed significantly better skin condition than non-users. Inspired by the Skin Destiny Study, SK-II looks to inspire women and men around the world to change their skin destiny and discover a future of beautiful forever. 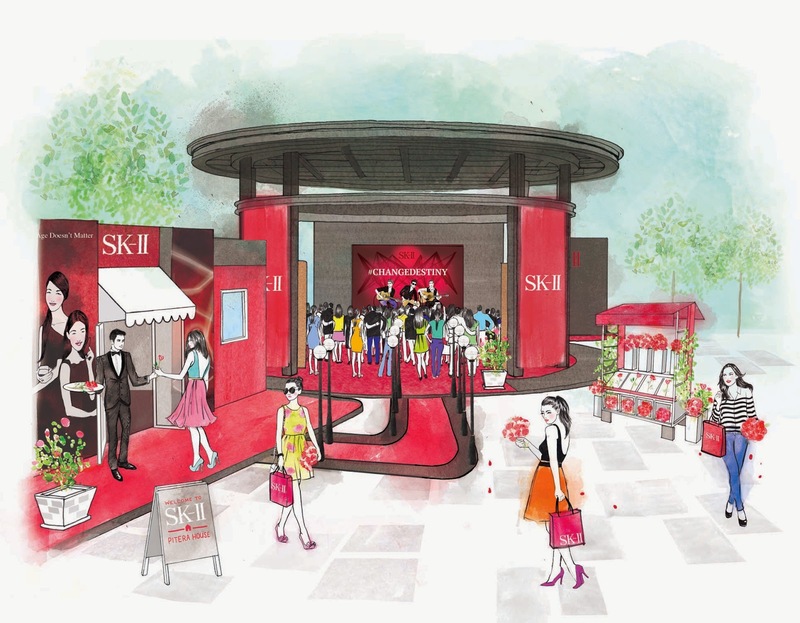 To showcase this beauty revolution, SK-II will be setting up its first ever SK-II Pitera House at Publika (The Square) in Kuala Lumpur from 7 Oct -14 Oct 2014. Not only you will learn more about the miracles of SK-II, you'll also get a complimentary skin check with the Magic Ring before embarking on your own transformation journey to change your skin destiny! Read about my Magic Ring Test here. There will also be Skin Destiny brunch workshops held on 10, 11 and 12 October 2014. You may pre-buy the vouchers at selected SK-II counters for RM200 which are fully redeemable for SK-II products at the SK-II Pitera House. There will also be a Friend Bring Friend promo where you bring one friend to purchase a Pitera Essence Set (PES) and register as a new crystal club member, you will receive one SK-II Facial Treatment Cleanser (20g) worth RM37. Bring two friends to purchase the PES and register them as new crystal club members, you will receive 2 bottle of the Facial Treatment Cleanser 20g worth RM74. Read about the 7 common questions about my SK-II skincare routine here. Upload a selfie at the SK-II Pitera House any day from 7 Oct-14 Oct 2014 on your Instagram and stand a chance to win a bottle of SK-II Facial Treatment Essence (75ml) worth RM229 each! Btw, I have 5 to giveaway! Follow my blog. You may find the follower tab on the sidebar. Leave a comment on this blog with your Follower ID/Name and Instagram ID/Name. Upload a selfie at the SK-II Pitera House any day from 7 Oct-14 Oct 2014 on your Instagram with hashtag #JQLeeChangeSkinDestiny and #skiipiterahousemy and tag me (@JQLEEJQ) on the picture. FIVE most creative selfies wins! Announcement will be made on my blog on 21 Oct 2014. *Please note that only the selfies uploaded between 7 Oct-14 Oct 2014 with the proper hashtag and tagging will qualify. Also, make sure it's set on public or I won't be able to see them. You've been so generous recently! Just Loved your blog btw! I have joined your insta contest and here are the details! I have joined and here are my details!